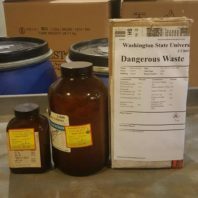 Washington State University is committed to the safe handling and disposal of hazardous materials. Environmental Health and Safety (EH&S) is dedicated to evaluating hazardous chemicals and chemical waste materials to determine appropriate disposal methodology minimizing WSU’s impact on the environment through reuse, recycling, incineration, and landfill. EH&S provides hazardous chemical and chemical waste management services to the campus community and will evaluate the material to determine the appropriate management methodology. Faculty, staff, and students can submit a Chemical Collection Request to have hazardous materials removed from the work area. A list of unused chemicals that can be redistributed within the campus is continuously updated. Any material that can not be reused is managed offsite at a state approved disposal facility. Although chemical waste is properly managed, WSU continues to look at ways to minimize the amount of material shipped offsite. Improperly managed hazardous waste can pollute the water and ground it comes into contact with, thereby posing a threat to human health and the environment. For example, one pint of oil has the potential to spread over nearly an acre of water surface. The sheen from the oil prevents sunlight from penetrating to the water’s depths and cuts off the supply of oxygen necessary for aquatic life. There is a responsibility that comes with using dangerous materials and WSU is proud to be a responsible disposer of dangerous waste. Due to this the United States Environmental Protection Agency and State of Washington Department of Ecology have established regulations regarding appropriate management of hazardous chemicals and chemical waste. Although WSU is responsible for for material on campus individuals should be consciences of the chemical waste they create at home because an individual can make a difference, too.